After a scene-setting introduction to chaos theory by host Jon Briggs, IFS CEO Alastair Sorbie took to the stage to set the agenda for the next three days: taking control of infinite possibilities in a chaotic business world. There are people from Japan, Australia, North and South America – we are grateful that so many people have taken the time and there are so many truly international companies here. 18 months ago we gathered in Boston and launched IFS Applications 9. We’ve received lots of feedback and we’ll be gathering more here. We have a vibrant and mature ecosystem of partners here, and we had a dinner and awards last night. 241 partners have registered and it was standing room only at the awards. I’m so pleased with the quality of the partners. We get feedback from you, as customers. I have the privilege of traveling the world, meeting customers on site, and seeing what you do with IFS. Cooperation with customers is core to our business, so we like to take your inputs into the core of our product directors. Our industry directors have the roadmap for the product with them and will share it with you. Our survey says that 87% of customers would recommend IFS over any other enterprise resource planning (ERP) package. But that’s still 13% we need to concentrate on. We get to share what’s next. The fun stuff starts to happen within IFS Labs. It’s a group within R&D that gets to experiment with new technology and explore how it fits in. I saw a demo of what they’re showing and I was very impressed. What’s next for us is what’s next for you – we’re following changes in industries with our investment. A small group of individuals working as a “dot” within the organization, because they’re frustrated. If you get involved with this transformation early on, some of the rewards come early in the process. IFS IoT Business Connector will allow you to connect IoT device via the internet to IFS Applications – this will be introduced in detail during the Tuesday session. Gartner identified IoT as the most hyped technology in 2015. We believe that the real business value will be in the industrial IoT. The World Economic Forum identified potentially huge value in the area – but unlock that value in a complex ecosystem is not simple. 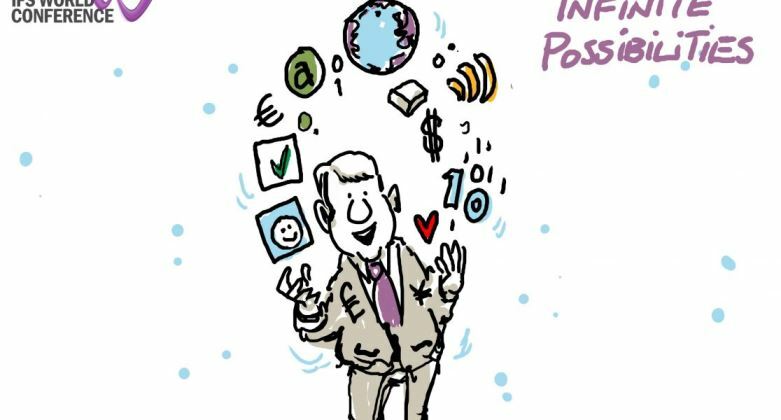 Many of our customers are still experimenting to understand how they can create the end-to-end value chains needed. Unlocking existing data is still complex. What is driving such great interest? Asset optimization: how do you run them longer and deal with breakdowns? Constant optimizations and reductions – but that’s not all. It’s also around driving new revenue and interactions with customers. If you think about your ability to connect to your products and learn how customers are using them in real time – that’s incredibly powerful. IFS has been recreating itself. In the early days, we had a tent outside our clients’ offices so the consultant could be close to clients. That tent is baked into our culture now – you’ll see photos of it in many offices around the world. From there we grew into 60 countries while maintaining that ethos of being close to our customers. But there wasn’t enough focus on profit – so when the dot-com crash came we had to change, with a strong emphasis on business control. But you can’t grow by tightening belts. As global giants emerged, we realized we had to focus on a number of processes in markets and go strongly after them. We also grew through acquisitions in the fields we wanted to dive deeper into. That started moving us into a leadership position in the Gartner Magic Quadrant for the fields we were targeting. But we were like Usain Bolt trying to run the 100m in a tight pencil skirt. The new owners EQT came along and they opened us up to faster growth. They set the management team the task of improving the business and investing in the parts of the business we see could improve. 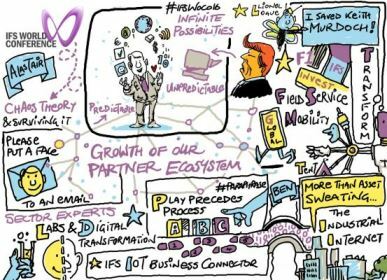 Mobility as a digital transformation catalyst war across all our key areas. Field service management – we acquired tow businesses in this space and we think it’s a huge opportunity because it’s widespread and growing. We’re hearing it can be more profitable to maintain the products than build them in the first place. Globalization – we’ve always paid attention to the ability to roll out IFS globally in a predictable manner. We started with IFS Applications 9 and we’ll continue with that. EQT noted we were something of a hidden gem in the industry. We want to get awareness up and we’ve started to do that. We’ve invested in branded sports. IFS has entered Formula 1. For the past 18 months, we have been a principal partner of the Sauber F1 Team. Millions of people see F1 on TV – it gets our brand awareness up considerably. A lot of things have happened to our products in the last year. But people matter, too. People want to buy software that is made by a company that’s a great place to work. A software business is a people business and you need great people, partners and customers. And we have all that. Some customers have been with us a long time – through the four eras we’ve talked about. A few years ago, the purpose of ERP was transaction processing. Back then we sold a predecessor system that was character-based. We’re now moved into analysis and informed decision making. It’s moved from data input to output and understanding. The coming era is digital transformation – and we’ll talk about that in the coming days. 2015 there were 5 early adopters. Now? There are 200,000 users. The main benefits are user experience – especially the lobby concept. Our vision is that you should love your business application – it’s a tough vision, but we think this is a big step. We have 500+ industry updates. We have lower total cost of ownership. The new layered application architecture significantly reduce the need for customization, making upgrades easier and sourcing consultants easier. The lobby is where you go first in IFS Applications 9. It shows you what you need to do, what’s lurking around the corner – the things that matter to you. It helps increase everyone’s productivity. When we created the lobby, we thought it should fit your organization and people like a second skill. We couldn’t do that if it needed traditional development to customize the lobby. If we can make it customizable without development, then you can create something beautiful for your business. Ingram Micro sat through a webinar for customizing the lobby and they got to work customizing lobbies for different teams. They put together one for the customer support teams. Five minutes after they followed up with the sales team, the purchasing manager was on the phone asking for one for the purchasing department. Ingram has been a customer since 1999, but they haven’t always upgraded to other versions. That’s true of many of you. There are many reasons – costs, and costs of implementation of new features with your ways of working. IFS Applications 9 kick-started our move towards evergreen business applications – constantly updated business applications with near to zero effort from you. That’s why we shifted to configuration from customization. That’s why we built a layered architecture – so we could update the underlying architecture without impacting the extensions layers. We’ve also moved from service packs every 12 to 18 months, and patches in between. If applying a service pack was too much work, you couldn’t take the patches. Eventually, you’d upgrade, but it was a big project. Now, it’s quarterly updates. No more service packs. If you apply updates regularly, you don’t need to take patches anymore. CDF took 12 hours to apply update 3. The Americas, the most active users of regular updates, sees an average of 22 hours for the update. That’s less than 100 hours a year to keep your business application evergreen! SAAB has a heavily customized install. It had 242 customizations and 48 integrations. 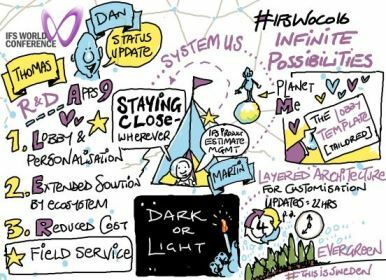 With IFS 9, that went down to 106 customizations and 44 integrations – but that’s still a lot. SAAB has taken two updates – updates 1 and 2. Pre-9, it would have been $90K, but now it’s 80% less. We are reducing the obstacles to the evergreen approach. Supporting global businesses is core to IFS. We still need country-specific extensions, particularly where local legislation is changing fast. We’re taking those extensions and merging them into one global extension. This is making it possible to take global updates in one extension. It makes evergreen within the reach of global businesses. IFS Product Estimate Management is our second new product announcement – it allows you to calculate prices quickly and accurately. It enables collaboration between the field sales team and the back office support team. Martin demos by pretending to be a robot lawn mower salesman – selling them to Göthenburg. He starts in the sales lobby and fills in data via the estimate assistant. His back-office assistant gets the request and puts the information in. His subscription is updated and he has what he needs to put the proposal in that day. Skansa used IFS Managed Cloud because they needed to get up and running quickly – and had unpredictable scale up needs very quickly. Their work managing the UK road network is based on bids with authorities and councils. They ordered in January and were at 50 users by April, at 250 by the summer and are expecting to be at over 500 by the new year. IFS Managed Cloud allows you to do great things faster and prepare for what comes next.